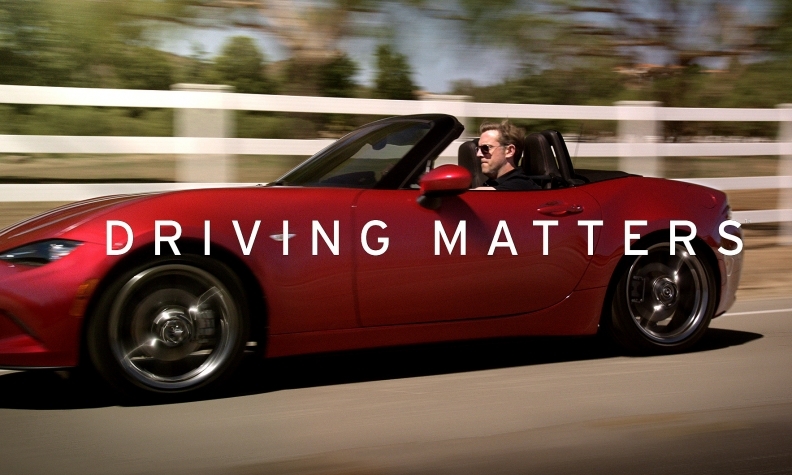 IRVINE, Calif. -- Fifteen years after coining the slogan "Zoom Zoom" to pitch its cars to customers who see driving as a pleasure and not a chore, Mazda Motor Corp. is hoping to refine its fun-to-drive message by launching its biggest U.S. marketing campaign in two years under a new tagline: "Driving Matters." As a small, independent automaker, Mazda lacks the name recognition and marketing dollars of rivals like Honda and Toyota. But executives hope a round of emotionally charged advertising will draw customers to its pint-sized CX-3 crossover and a redesigned version of the iconic MX-5 Miata roadster. "When we go into a focus group, we do a first opening statement. 'When I say Mazda, what do you think of?'" said Russell Wager, vice president of U.S. marketing at Mazda. "Nine times out of 10 they say 'Zoom Zoom,'" he added, banging a table for emphasis. "Then I'll ask them to explain to me what 'Zoom Zoom' means, and I'll get 6 or 7 different answers. That's what Driving Matters is supposed to address. It's supposed to solidify what 'Zoom Zoom' means to people." Mazda will begin its push Friday with a 60-second spot called "A Driver's Life" that will air on television and in movie theaters nationwide. 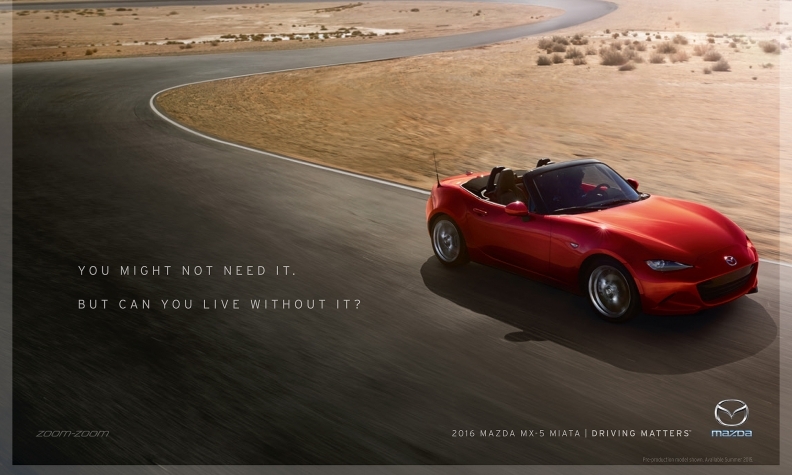 Narrated in sentimental rhyme, the advertisement shows a man's life arc from one sports car to another. He drives a beat-up MX-5 Miata roadster through college. When he gets married, he buys a Mazda3 for practicality's sake, followed by a CX-5 crossover to fit a growing family. In middle age he buys a new MX-5 because it “reminds you of when you were you," as the actor Aaron Paul, best known for his role in the television series "Breaking Bad," says in a voiceover. Mazda's campaign also includes 47 advertisements in 26 magazines and home-page advertisements on websites such as YouTube.com and ESPN.com. It replaces the two-year-old "Game Changers" campaign, which compared Mazda's products to groundbreaking inventions. Wager said the outgoing campaign did its job by raising Mazda’s brand awareness and informing customers about its suite of Skyactiv engines and chassis, but customers didn't have strong feelings. "We need more people to have an opinion," he said. The first television ad is purely emotional, but others seek to show how Mazda's safety features, efficient engines and agile handling make life better. A second spot called "Superstrada," which will appear on television starting June 1, will show the singular moment of driving fun that a Mazda owner looks forward to on an otherwise dull commute. Making its debut the same day is a YouTube video geared toward car enthusiasts, for which Mazda balanced the new Miata on a fulcrum to show off a perfect 50-50 weight distribution from front to rear. The whole campaign was devised by Orange County-based Garage Team Mazda, which was formed in 2010 by advertising giant WPP to serve as Mazda's creative agency of record. Garage Team Mazda was also responsible for the 2013 launch of "Game Changers," which was the first major campaign that Mazda had launched since "Zoom Zoom" in 2000. Mazda will continue using the Zoom Zoom slogan in its advertising during the Driving Matters campaign. Game Changers used dark, intense colors, often placing red cars against black backgrounds. The faded colors of Mazda's new advertisements look as if they've been run through a filter on the photo-sharing website Instagram, to make them feel more real and less like “fantasy,” Wager said. Mazda also made a minor change to its insignia for the campaign. Beneath the company’s winged ‘M’ logo, the word "Mazda" now has a glowing blue border and a larger font to help people associate the logo with the Mazda name. A few years ago, marketing research showed that one-third of car buyers fit into this mold, Wager said. More recent numbers suggest that just one-fourth of car buyers fit the mold. More and more people just want a car to get from Point A to Point B, so they may not be willing to spend a little bit extra for a Mazda. That still leaves 4 million cars in a U.S. market where 16 million cars are sold per year, Wager said, which means there is room for Mazda to grow. The company sold 305,801 vehicles in 2014, a 1.8 percent share of the U.S. car and light truck market.